Rev. Dr Hur Won Koo preaching at the Ecumenical Centre chapel in Geneva. During a recent visit, members of the committee responsible for hosting the World Council of Churches' (WCC) upcoming assembly in Busan shared their immense hope for a “meaningful and successful assembly” which will bring together the worldwide fellowship of WCC member churches in the Republic of Korea for celebration, deliberations and prayer. The Korean Host Committee for the WCC assembly, representing WCC member churches in the Republic of Korea as well as many churches that are not members of the WCC, offered their reflections at a meeting with the WCC staff on 27 September at the Ecumenical Centre in Geneva, Switzerland. 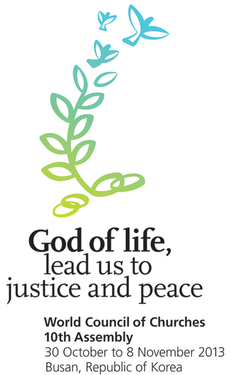 The delegation was in Geneva to coordinate the final stages of preparation for the 10th Assembly of the WCC, which takes place from 30 October to 8 November in the city of Busan under the theme “God of life, lead us to justice and peace”. Rev. Dr Hur Won Koo, chair of the Busan Host Committee, called the WCC assembly a “wonderful opportunity for churches to seek to be effective peacemakers”. He communicated the aspiration of the Korean churches to share a “strong Christian witness” in the WCC’s mission for justice and peace. The WCC general secretary, Rev. Dr Olav Fykse Tveit, expressed his gratitude to the members of the Korean Host Committee and to the Korean churches for their significant efforts in hosting the WCC assembly. Tveit also affirmed his hope that the assembly will strengthen Christian witness by providing space “to share and explore the human and spiritual dimensions of churches’ work for peace”. Rev. Dr Kim Sam Hwan, moderator of the Korean Host Committee, noted that the committee is working with many churches, including Evangelical and Pentecostal churches, to prepare for the Busan assembly. He said that the Korean churches are eagerly waiting to welcome the delegates and participants from all around world. “The Busan assembly will be a wonderful event through which to experience that we are brothers and sisters, as one family of the Triune God,” he said. Kim expressed his hope that the WCC assembly will deepen the ecumenical spirit in local congregations that are being encouraged to pray for the assembly and take part in the programme. He added that the assembly is expected to “contribute to peace and reconciliation on the Korean peninsula”. Lee Byoung Gook, director general for Religious Affairs of the Republic of Korea, confirmed again the government’s commitment to provide all the support necessary for the success of the assembly. Members of the Korean delegation included Rev. 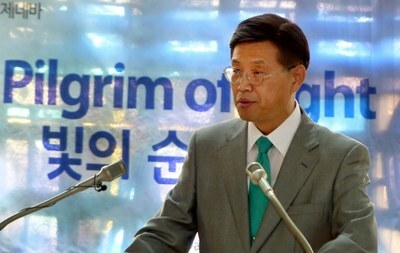 Dr Park Jong Hwa, Rev. Sohn In Woong, Rev. Dr Chang Sang, Rev. Dr Kim Young Ju, Rev. Dr Cho Seong Gi, Rev. Dr Lee Hong Jung, Rev. Dr Yang Myong Duk, Rev. Hur Shin Guk, Rev. Kim Wang Yeon, Park Jae Chan and Kim Joo Won.